I’m rather pleased it was Jan that awoke early and arose to start the central heating before calling her mum. Well actually I can start the Hurricane heater from my bedside but I’m not going to let that spoil a good story! It was a crisp but clear morning and we decided to move. After 3 years the Hurricane has 1000 hours on the meter and is due for its first service. It’s not an overly complicated task but I’ve decided to let the UK distributors (Calcutt Boats) do it whilst I watch. Jan initially stayed inside Waiouru to get the slow cooker going (roast beef tonight) and bake a loaf of bread for lunch. This was to be a new recipe involving honey as an ingredient. She joined me mid morning with a hot mug of chocolate (for me) in one hand. The cruise to Napton Juncton (Wigrams Turn) was relatively uneventful. Two hire boats going in the opposite direction; one of which had the throttle well open. 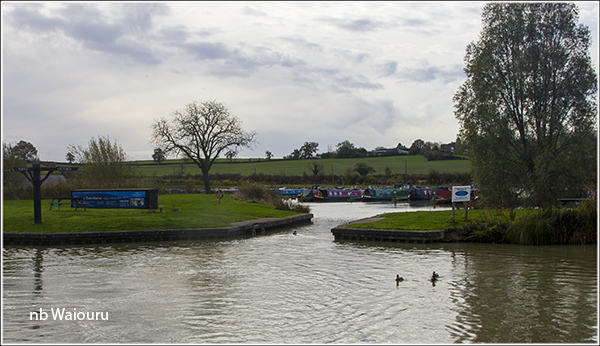 It got busy at Napton Junction with a boat approaching from the opposite direction and then the sound of a horn as the bow of a boat appeared from Wigrams Turn Marina. The entrance to Wigrams Turn Marina. 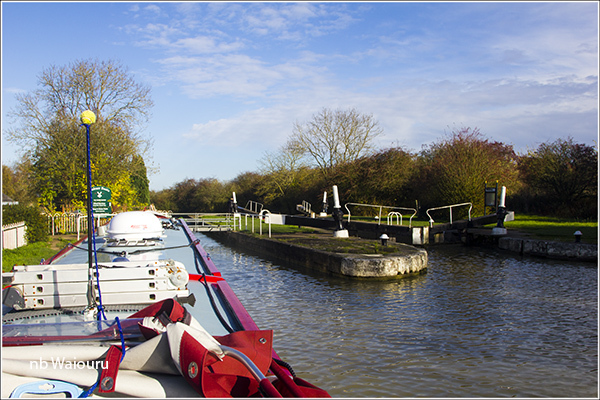 Although we turned right at the junction we are still on the Grand Union Canal. The boat that exited the marina was ahead and going quite slowly. Actually so slowly that I had to keep knocking the throttle into neutral to maintain their speed. At Calcutt Top Lock a boat was moored on the lock mooring (most helpful). However it didn’t affect us as we wanted to top up the water tank which is adjacent to the lock. Jan went off to Calcutt Chandlers to see if she could buy some “Rub Boy” cleaning tablets for the Refleks diesel stove. It’s not urgent, but a spare packet would be useful. Meanwhile I monitored the filling of the tank and gave the cabin roof a clean. Looks like the local fowl have been using the sat-dome as a bomb aiming mark. Jan returned looking very pleased after having a chance meeting with Victoria from Clifton Cruisers. She and Phil had sold the business and she is now the manager. By coincidence Victoria had a letter from CRT addressed to us containing our 2015 license and labels. Another admin matter sorted! Once the tank was full it was my turn to head to the Calcutt office and ask about booking a service for the Hurricane. The engineer is on holiday until the end of the month so we will call back in about four weeks. Of course all three locks were against us, but we’re not in a hurry and Jan worked Waiouru down using the paddles on one side only. 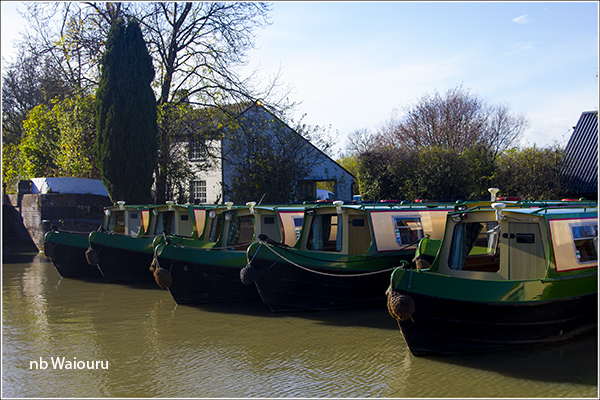 From the number of moored Calcutt hire boats it appears the hire season is well over for this season. We decided to stop for the day about half way between the two flights of locks. No problem finding the dot or a terrestrial signal so Jan should be able to record tonight’s episode of Grantchester without any difficulty. The freshly baked loaf of bread with the secret ingredients was delicious with a slice (or two) of butter on top! In the afternoon I went hedgerow foraging returning with half a bag of sloes and the location of an apple tree laden with fruit. Jan is thinking of sloe chutney and stewing the apples (yet to be picked) to make a pie filling. One thing we did notice today was the speed of passing boats. It’s obvious that Waiouru is occupied but that doesn’t appear to deter them from speeding past. Maybe they are attempting to beat a stoppage? And there was I hoping you would do one of your step by step guides that I could follow on servicing a hurricane. I would be interested how you get on with Calcutts. Mine is also quite noisy so if you have any tips on making it quieter. Ours sounds like a jumbo half way through takeoff!